Please Click here for the Sussex Group’s training dates. 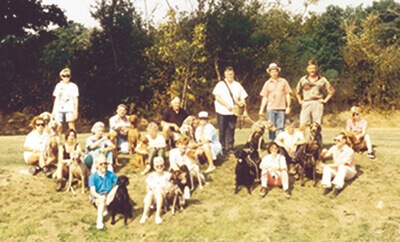 The Sussex group was founded in 1979/80 by a small group of GSP owning enthusiasts who used to meet for training sessions at Stanmer Woods, near Brighton. As knowledge of the group spread it steadily grew, being granted Branch status in the 1980s. Annual Working Tests were set up, at first with the South Eastern Counties Branches, but this has now become an inter-branch competition involving all five of the Branches/Groups in the South of England. Training takes place at the Ashdown Forest during the summer and at Laughton, Near Lewes, during the winter. Both grounds consist mainly of woodland, and there is suitable water available for training purposes. Sessions are held on the fourth Sunday in each month, starting at 10.30am. We make every effort to tailor training to the needs of the individual, be it to compete in trials or working tests; to shoot over the dogs, or just to have a happy, obedient pet. The Branch has some 40 members who guarantee you a friendly welcome and good, sound advice from experienced trainers. Our Branch is expanding rapidly and in 2000 we organised field trial training days. Who knows, but watch this space.